The month of Rajab is a blessed one in the Muslim calendar and famous for the 22 Rajab niaz that is held in many houses including mine since generations. This niaz is also called “Koonday” and observed to increase rizk in the house. My dada (paternal grandfather) is from Hyderabad Deccan and made special Param/Meethi Puri for the Rajab niaz. 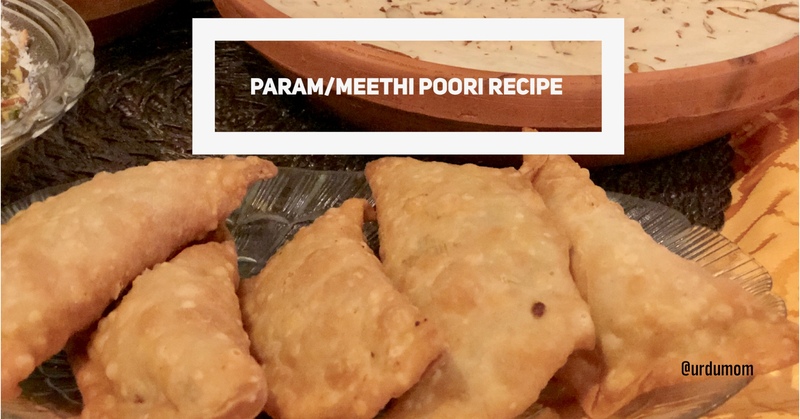 This Param/Meethi Puri recipe has been passed through our family for decades and today I’m happy to share it with you. Do enjoy it with kheer! Mix the all purpose flour with the sooji and add a pinch of salt with a tablespoon of sugar. Add a little milk and knead (a lot!). The kneaded mix would be harder than what you would have for roti. Now leave it outside for an hour and knead again. Crush the walnuts and remove the skin from the almonds. Crush the almonds, pistachios, peanuts and the pine nuts separately. Keep all nuts separate. Cut the coconut slices into small long pieces. Fry the almonds, almonds and peanuts separately. Now mix all the nuts with the Kalakand and the sugar. Take some mix out of the prepared flour mix and make a big ball. Now roll out like a fat chapatti and heat it on a tawa without oil on both sides. Crush it into pieces and pass through a big holes colander. Add to the nuts mix. Now make small balls with the remaining flour mix and roll out as thin chapattis. Sprinkle dry all purpose flour as needed if it sticks. Add the nuts mix in the middle and fold the chapati as below. Make sure you close he ends properly. Place these on newspaper or butter paper. Don’t place on one top of the other and keep separated. You can freeze these also at this point. To serve, deep fry in a wok making sure it’s evenly cooked from all sides. Serve with kheer and enjoy! This recipe will make around 30 puris. You can also freeze them and fry as required! Do let me know if you try this recipe!